The Russian military challenged video footage used by the UK-based, Atlantic Council backed Bellingcat. Serial numbers of missile that downed MH17 show it was owned by Ukraine – MoD. The Bellingcat investigation was featured in the latest update by Dutch prosecutors involved in the MH17 investigation, prompting the Russian military to study it in detail, they said. The Russian video showed an example of how an Abrams tank can be shown to be carried by a trailer in the streets of Ukraine in the same way. The Russian military say the complaints came from Col. Ruslan Grinchak, who serves in a brigade responsible for radar control of the Ukrainian airspace. His unit tracked the MH17 flight in 2014, so he may have information which is not publicly available about the disaster. The Joint Investigation Team, which is lead by the Netherlands, includes Ukraine, but not Russia. Moscow believes that the investigation is biased, failing to obtain all necessary evidence from Ukraine and relying on questionable sources while ignoring evidence provided by Russia, which doesn’t fit the theory favored by Kiev. Facts don’t count a bit for US/NATO-Mafia + their Serfs/Slaves/Minions, if it don’t fit their view, narrative + perception of reality. RUSSIA DOWNED MH17, AS PROVEN BY ALL EVIDENCE. THE KURSK BRIGADE WAS EVEN AWARDED FOR IT BY PUTIN. THE TRIAL AGAINST RUSSIA FOR DOWNING MH17 STARTS IN 2020. Proven by “ALL” evidence??? Are you a Kangaroo??? That apparently is the type of court you swear by!!! Russia vetoed even an International Court for MH17. 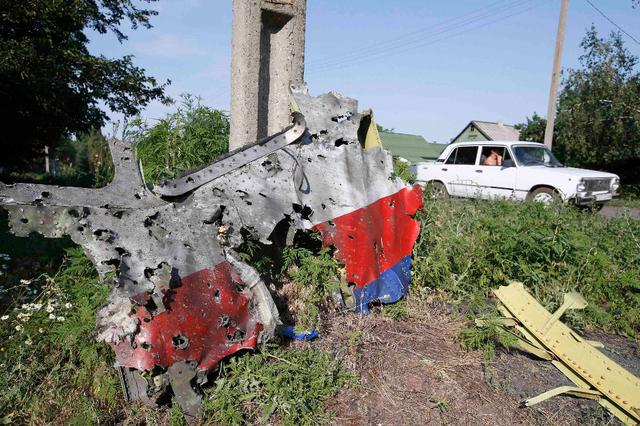 You and your criminal friends have a term for MH17: collateral damage, so what the fuss is all about? No, they refused to allow the US to create a witch-hunt under the UN banner, controlled by NATO-appointed assets to deliver a pre-determined political payload. More lying Bs! All the evidence points to the Ukronazi army, which is the only entity which possessed BUKs in the region. The Russian Army in Russia occupied Donbass has 160 BUKsystems since the invasion in 2014. Which evidence? The Dutch Safety Board even falsified evidence with the reconstruction of MH-17. Russia refused for 4 years to show any evidence, ,,,,,,,,,,The BUK was registered at Kursk in Russia. There wasn’t a BUK! The Dutch Safety Board falsified evidence during the reconstruction. I gave the proof above. Congrats!!! You win this years award for the Most Stupid Banderite Inbred!!! To collect your reward, you’ll need to head down to the front against the Heroic Defenders of Free Donbass and enlist to take your turn as meat for the grinder. Die with some dignity, Ukropi orc. Well, I have some disturbing news for the Dutch Safety Board, JIT team, Dutch Government, and Dutch MEANstream media. So, if Almaz-Antey handed over some information that the BUK missile couldn’t be launched from rebel held area, but from Ukraine occupied territory instead, this information will not see the light of day. Search for the diffrences! Why did the Dutch Safety Board used another cockpit panel during the reconstruction of MH-17? I hope that after this clearly shown fake, no one will believe Bellingcat any more. But I suppose US and British secret services still need Bellingcat in cases in which they cannot produce good fakes – then, they support Bellingcat‘s bad fakes and still can claim it wasn’t them when the fakes are too obvious. It isn’t known what kind of unit he commanded or with what they were equipped. Somebody used something to drop at least two high-flying Ukrainian aircraft. Who is in possession of the Buk parts? There exists a video of a ‘EUkrainian’ anti-aircraft unit CO surrendering his unit and its equipment o the dissident forces. I have seen that on the former Militaryphotos.net site (Ukraine thread) . That site is archived. It wasn’t clear what kind of AA unit it was, or with what it as equipped. But somebody used something to drop at least two high-flying EUkrainian aircraft in the days preceding MH17. The parallel incisions in the left wing can only have been made by the stabilizer fins of an air to air missile. There should have been hundreds of pieces of BUK shrapnel. The few pieces that were found were planted. The cockpit was riddled with 30 mm cannon shells. This BUK stuff is nonsense. Washington and London are hiding the technical data because it reveals the Ukrainian Sukhoi that shot down MH17. OLd news – we know that corrupt murderous Kiev and their depraved Zio-Western global-traitor backers were always behind this perverted crime.